During the Sao Paulo International Automobile Trade Show, Chery showcased its new models, such as the Arrizo 5, Tiggo 2, and QQ, which received the Conpet trophy for its fuel economy. This isn’t the first time the QQ was honored in Brazil. It was previously named one of the Most Economical Cars in Brazil; in April, it was scored AA (the highest) in the Conpet catalogue by Inmetro, meaning that the model has the lowest emission in the sub-compact category and been rated as one of the most efficient and economical cars in overall ranking of fuel consumption, according to Chery. With broad market space, Brazil has been a major strategic market for Chery. In 2010, Chery invested U.S. $400 million to establish Chery Brazil Industrial Park, which was completed in August 2014. With an area of 4.19 million square meters, an annual output of 50,000 units in Phase 1 and a planned annual output of 150,000 units in Phase 2, the park was designed and constructed in accordance with advanced and latest international standards. In the future, the park will rely on Chery vehicles and bring in relevant auto parts industries to boost Chery’s localization and enhance the comprehensive competitiveness of Chery’s products in Brazil. The Chery Brazil Plant is Chery’s largest solely-funded overseas plant, according to the automaker. 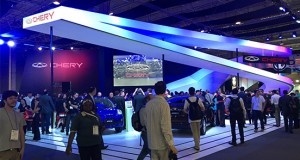 At the same time Chery was showcasing its products in Sao Paulo, it was also exhibiting at the 15th Bogota (Colombia) International Motor Show. Chery displayed a lineup of nine models. The Tiggo 3, the first SUV taxicab in Colombia, was among the models featured at the Chery booth. In 2016, Chery delivered 2,200 yellow Tiggo taxicabs to Colombia, and was listed in Colombia’s taxicab catalogue as a “business changer in the taxicab field.” The Tiggo 3 taxicab has earned high recognition from the Colombian market with average monthly sales of over 150 units to date, according to the automaker. Chery entered the Colombian market in 2007, and currently has a car parc of 30,000 units in Colombia and has been China’s largest passenger vehicle exporter for six consecutive years. Despite the economic slowdown of Latin America in recent years, with Chinese brands facing a severe test in Latin American countries, Chery, relying on strong product power and penetrating localization strategy, still remains the first place in Colombian auto market share, according to the automaker.